Richard McClung (right) presents the Pioneer Award to the family of Burke Healey (from left) Haden, Erin, Easton, Janet and Brian. The Beef Improvement Federation (BIF) posthumously honored Burke Healey as a recipient of the Pioneer Award at the 35th Annual Convention in Lexington, Kentucky, on May 30, 2003. The award recognizes individuals who have made lasting contributions to the improvement of beef cattle. Burke Healeys name has always been synonymous with being a leader, a visionary, and an advocate of the beef industry. Burke possessed a great dedication to cattle production and he pursued the success of the industry as well as the success of his own herd with a passion. Burke was a cattle producer with his wife, Tina, and five children at the Southern Cross Ranch in Davis, Oklahoma. The original ranch, the Flying L, was co-owned with his brother Skip until 1988. After 1988, the ranch was divided into two ranches, the Flying L and Southern Cross. The Southern Cross is a 3,500-acre Hereford cattle operation appropriately called "Hereford Heaven" near the Arbuckle mountains. The Healeys operation is regarded as one of the premier Hereford herds in North America and a cornerstone for performance programs with beef cattle. Early in life, Burke attended Duke University to study business, and he later completed his education at Oklahoma State University with a degree in Animal Husbandry in 1955. Burke has been recognized on several occasions for his contributions to Oklahoma State University, and he was honored as an OSU Graduate of Distinction in 1980. Burke was a member of the Oklahoma State University Board of Regents from 1963 to 1975, serving as chairman for four years. In 2001, he was recognized by Oklahoma State University as the Distinguished Agriculture Alumnus. Burke was a respected member of the beef industry and he served the industry well at local, state, and national levels. Burke once said "the most effective way to cope with change was to help create it". As leaders in the industry, Burke Healey and his family were active members of many organizations such as Oklahoma Beef Cattle Improvement Association, Oklahoma Beef Incorporated, American Hereford Association, and National Cattlemens Beef Association. He actively participated in several committees for the National Cattlemens Beef Association, Cattlemens Beef Promotion and Research Board, Beef Industry Council, American Hereford Association, and numerous others. He has been an integral part of the Beef Improvement Federations evolution in multiple roles with the most distinguished as President in 1996 to 1997. As a leader in the performance movement, Burke made many contributions especially in the area of linear measurements and adoption of frame scores. Burke was quoted as saying, "From the first day we started our operation, our goal was not to be breed multipliers, but rather breed improvers". Burke always maintained a strong presence in the performance movement ranging from recording weights to gene mapping. The contributions made by Burke and the Healey family have been recognized in many ways. Bob deBacas book, "Courageous Cattlemen," has recognized Burke Healey as one of 50 cattlemen and researchers who most influenced the performance movement in U.S. beef production. In 1994, Burke was named the Trailblazer of the year by BEEF Magazine. 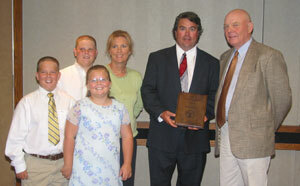 The Beef Improvement Federation honored Burke in 1998 with the Continuing Service award. H.H. Hop Dickenson, former Executive Vice President of the American Hereford Association said, "Burke Healey has not only been a performance advocate, but made it a policy to understand what each step of research application meant. He is essentially a combination of cattlemen and a scientist. And he has a grasp of worldwide research on a new technology before he puts it into place in their operation." Burke Healey passed away on October 14, 2002 at his home in Davis, Oklahoma.